PRO Homogenizers are ideal homogenizers for soft, thick samples like avocado fruit (persea americana). When samples are properly prepared to be approximately 1/2 the diameter of the PRO Quick Connect Generator Probe, the probe's precision crafted very narrow clearance between the inner rotating shaft and outer tube/chamber allows for quick, effective and repetitive tissue homogenizing. This means you will get the results you want each and every time. Most homogenization of for this type of sample will take only seconds at minimum to mid-speed setting. This quick homogenization eliminates heat production and ensures preservation of the sample. The Bio-Gen PRO200 Homogenizer with a 7mm Generator Probe. The Bio-Gen PRO200 Homogenizer with a 10mm Generator Probe. The Bio-Gen PRO200 Homogenizer with a 20mm Generator Probe. 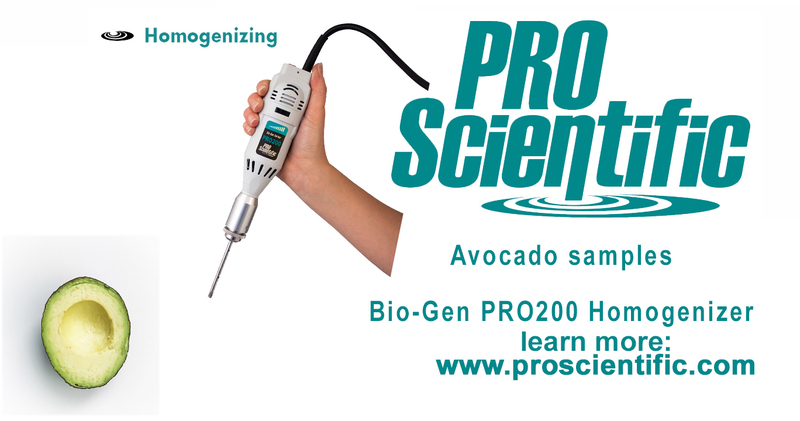 Concerned about cross contamination between your avocado homogenizer samples? Try the D-Series Benchtop Homogenizer with a larger diameter PRO Quick Connect Generator Probe.